I was out gardening before work again a few mornings back. The weather is changing, the first of our chooks is moulting… some things need to happen now and soon! 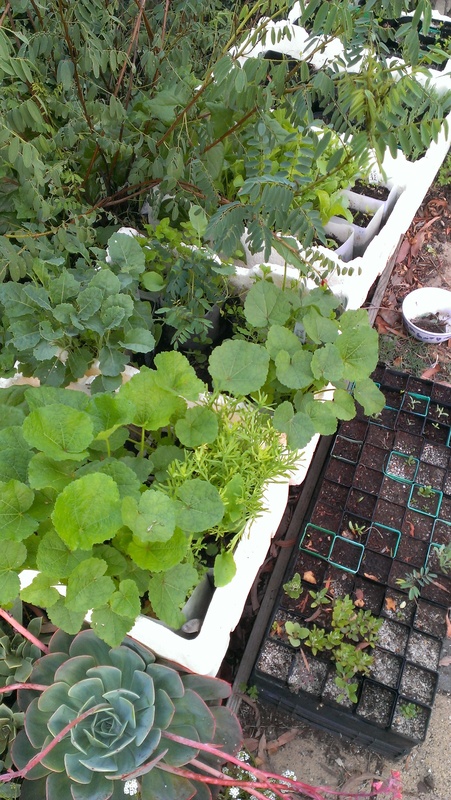 The vegetable and flower seedlings have been growing quickly. In went rocket, lettuce, kale, broccoli and hollyhocks. Not quite done, but well on the way. 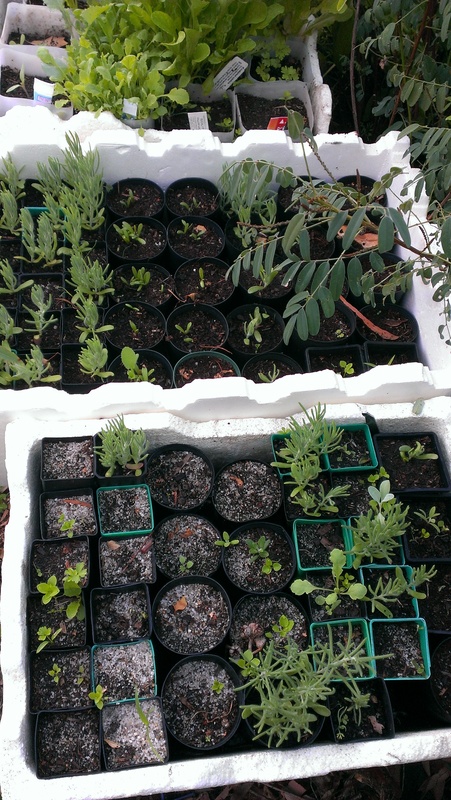 The native plants have continued to sprout and grow, with ruby saltbush still the big success story. The biggest went into the ground this morning. Here they are in a bucket ready to travel. Those I planted earliest in the season are quite a good size now. In the site where council watering has helped them on, only one seedling was lost. In the drier site (further from home), about half have made it. Many non plussed cyclists passed as I planted. One woman with a dog stopped to thank me and express her concern about all the newly planted natives that died when cars kept parking on them. We talked about what could be done. 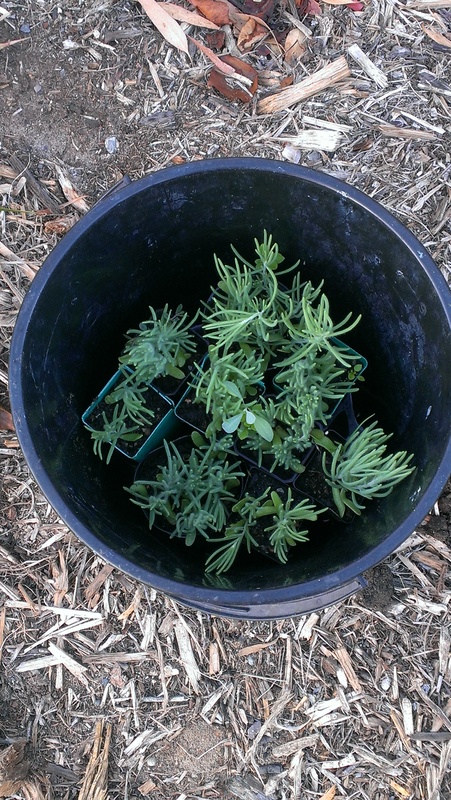 I was planting in a spot where over several nights someone stole the plants out of the ground–about 12 in all! So we talked about that, as she passes with her dog every day and notices things I also notice. She spoke of the bunting and how she had been maintaining it. It’s good to know and to remember that for every person who tears it down there might be several like this woman stopping to maintain it and being made cheerier by seeing it and understanding they have company in loving trees and plants. Then it was clean up time. People dump stuff in the common land. Why is it so? Well, I extracted the plastic sack that was coming apart from its contents (old horse manure and sawdust, could be worse) and took it to the bin. 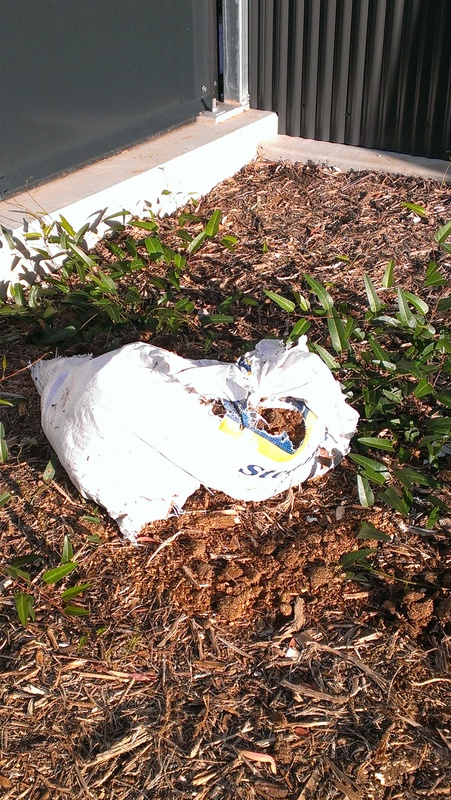 If only those degradable bags were capable of decomposing in the sense that dead plant life decomposes. Then I towed all the dead branches someone had piled around the base of one of my beloved trees home. 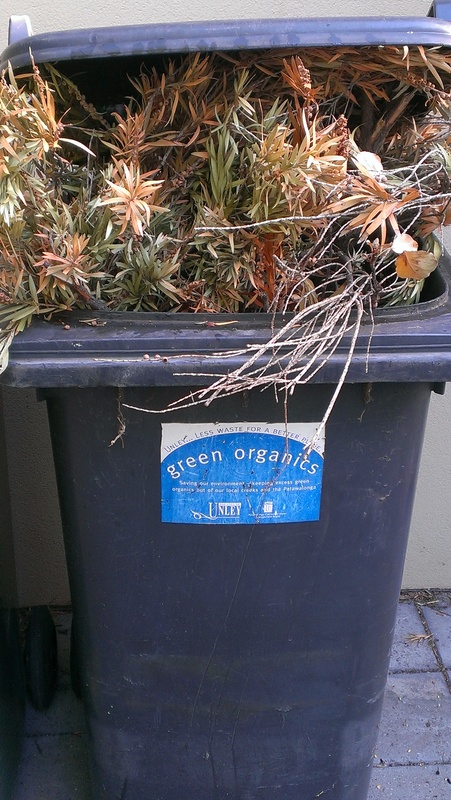 Happily our ‘green waste’ bin for council collection is almost always empty. We’re big mulchers. We have worms and chooks and compost systems. So the green bin is there for rescue missions, and its contents can go to be composted by council. Last time someone dumped in this spot, They left a huge pot in several pieces. Only one small piece was missing, so I heaved it home and glued it together. 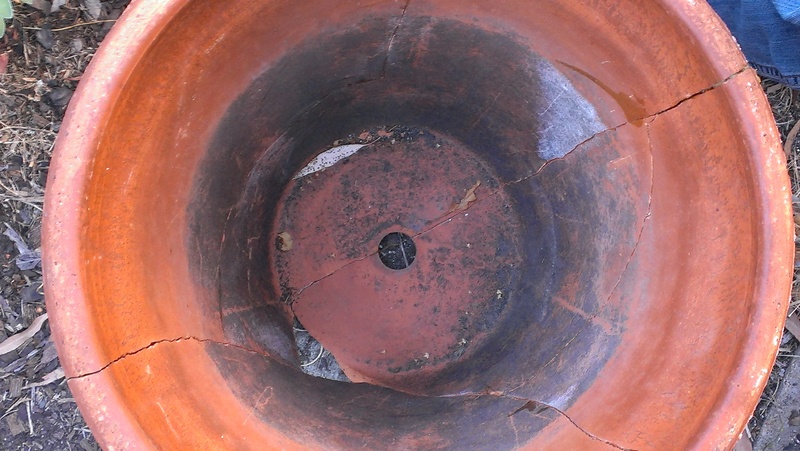 It seems to be holding, so one big ugly plastic pot that is doing a great job of holding a plant, got placed inside. Definitely an improvement. While I did these things I thought about what it means that people dump things on common land here. Is there something about this site I could change, that would make this a less favoured location, for example. I have been thinking a lot about the injunction in Indigenous law to recognise that we are interconnected–earth, animals, plants, sky, humans, stars, wind… I’ve been wondering what would follow for non Indigenous people if we tried to live by the core principles of Indigenous law in this country (as best we can understand them–and recognising this will always be partial) instead of thinking of Indigenous principles as a curiosity. A bit like a religion you don’t really understand but that you can acknowledge exists and holds meaning for others. This is preferable to outright hostility, and growing up in this country I have seen that hostility and disrespect for Indigenous Australians since I was a small child. But it is still pretty impoverished as a way of thinking our relationships to the land, its people and its law. Continuing with this thought experiment, I was trying out in my mind what it would mean to think of this tree as a relative in some profound sense. I am sure it would mean I wouldn’t choose this spot as a place to put rubbish. Respect would surely be part of that relationship. I have been thinking about relationships and what they can mean. I wondered whether I could draw strength from that tree as well as plant an understory that might protect it a little and clean up the mess passing humans leave. I thought that I could and that I do. If we are all part of one another (and this is something I believe on many levels), surely it follows that I don’t get to pick and choose. I have often thought one of the profound things about Indigenous life prior to colonisation is that an Indigenous relationship to land is a profound and permanent thing: each person who belonged to a place would have expected to live there for their entire life and die there. Something so profoundly unlike contemporary Western lives lived with the capacity to leave your relatives, your place of birth, everyone you have ever known and choose not to return. If there was no picking and choosing, if we are all interconnected: what is my relationship to these people who leave what they don’t want on the commons of our suburb? What obligations do I have to them? How should I think about them? I don’t have any answers, but some days I think I might be on to some decent questions. That I’m wondering in a productive direction. I hope so. 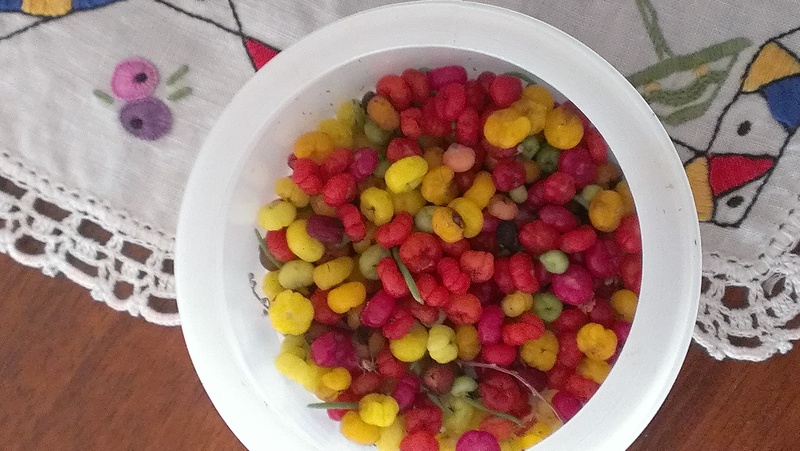 So I gathered more saltbush berries and kept thinking. I found this post very interesting. I am not from Australia. I first came to live here in 2001 and I was horrified by the hostility and disrespect for Indigenous Australians that I saw and heard, even from people who on many fronts seemed good hearted. I continue to feel a sense of unease about this issue in Australia and being a Westerner a sense of guilt for my ancestors’ behaviour. Any ideas on how to live respectfully in our newly shaped habitat of Adelaide interest me greatly and I too believe we are all interconnected on many levels. As a family we enjoy removing rubbish from Adelaide beaches and saving local plants. Bless you for your care of beaches and plants! I think if you feel no unease living in a colonised country with an ongoing heritage of racism and dispossession and all that flows from these things–then you’re not paying enough attention. My ancestors are from far away too, and I think it is right to consider what responsibilities we hold–and to continue to reflect on this question. I hope I am currently feeling my way toward some fresh thinking on this subject–but there are also well worn ideas that have never grown stale. You are so welcome. Your collaboration sounds very interesting. Tandanya is a wonderful place to visit, but I am guessing you have been there! Would the plantings have a better chance of survival if you chose non-human-friendly plants. Plants with spikes, thorns, or that tend to give nasty rashes. One encounter would cure the “dumpers”. Interesting idea! I have found in my other reveg sites that if you can protect the small plants for long enough, in time people do not consider a planted area as a space to walk through. But there are wonderfully prickly wattles… perhaps I should collect seed in case of need 🙂 I suspect even thorny plants have to find their way past the point where a dog can snuff them out without noticing or a boot can squash them. A plant with qualities like gorse would deter just about everything and everyone. The spikes work like a natural defense system. It’s so true! Gorse is a massive weed here. But the stories of plants as a defence system fascinate me. I think here that some of the spiky wattles would probably be the Indigenous equivalent. what interesting proposals about choice and relativity …. 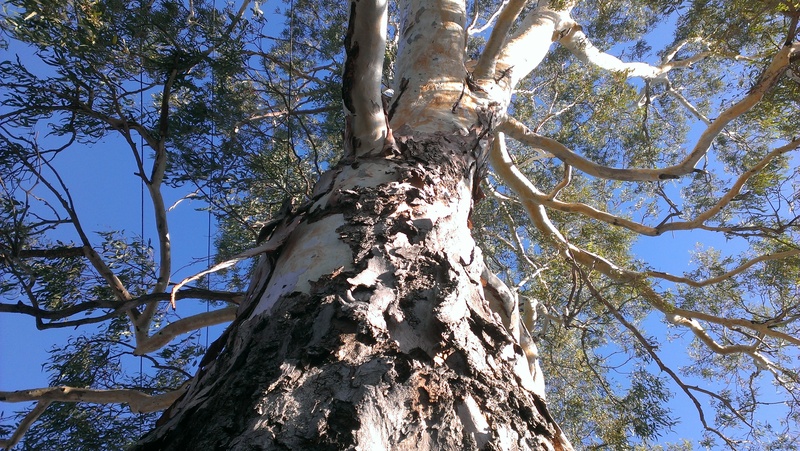 leaves me with lots of thoughts … and you are so inspiring, looking after your community’s trees. and I’m horrified though I suppose I shouldn’t be surprised that Indigenous Australians are still treated like that. so many people can only feel empathy for their own tribe, and here in the UK generally there is as much chauvinism and litter throwing as ever. and our local trees are treated to a philosophy that varies widely from silver birch being rooted out as an invasive weed where the Wildlife Trust wants to preserve anachronistic heathland rather than original woodland, to our village holm oak spinney gradually being reduced by the National Trust’s health and safety concerns and nice and tidy attitude. That is sweet of you, Jane. By the time they came here, English (and Scottish and Irish–but especially English) people had already done so much to deforest their own lands. And had been closely tending the landscape in much of their own countries for a long time. I could not believe the landscape around Keele University, one of the few places I have been outside a big city in England–I could see for myself the greens that the early colonists here missed so dreadfully. I could see how the hedgerows by the sides of the roads had been tended for time beyond memory, and how different this must have been to the wildness English colonists found here. I could see the kind of scenery and sheep safely grazing they saw as home. It was a different way of understanding why they seemed to take the view that Australia was a place where water was being wasted (not driving millwheels) wood was being wasted (not burned, turned into ships and suchlike) and land was being wasted (not cultivated). To me it felt deeply foreign, even now. Australia’s long legacy of racism is a cause for shame and self reflection, there’s no doubt at all about that. I read George Monbiot’s book Feral with a mixture of sadness and optimism, as he discussed many of the things you are speaking of, Jane. Voting Green has to start with someone! I am sure you’re not alone, Jane. Oh, I don’t even know where to start. Wonderful post. I have always had my Celtic genes front and center when looking at nature. ‘They’ have started strip logging where I usually walk and when I first saw it I was physically sick in my gut. I will look at the posts you mentioned but I have such trouble looking at what ‘we’ did here that I cannot guarantee I will be able to look at them. It isn’t that i don’t want to know, I have too much empathy and it sort of freezes me. Yes, and how does one feel about people who litter without getting our knickers in a twist ! Damn. OK, gorse is great, how about thistles? I love them and they did alert the Scots when the Danes were invading…one of the invaders stepped on one and let out a shout:) At least that’s how the story goes………. Oops thistles are also a very nasty pest species in Australia and not welcome on farms or anywhere else. Great ideas to ponder Maz. Recently, visiting my family in Newcastle (NSW) we saw a woman walking along the beach with a pair of tongs and a sackful of rubbish she’d collected. Thanks for all like her. If nothing else meeting the dog walker reinforced that there’s someone else who cares. Lets hope that strengthens both of you and the message goes out to others through such connections. Ah, you sighted another sister! We are many even if we are not all known to each other. It certainly does hearten me to meet folk in my neighbourhood who clearly care. And it heartens me to have friends like you on the web who care too, Leonie. Thankyou. I think it is good to honour all thistles have done growing where they belong! I have Scots heritage and feel fondly toward them as a sign of Scotland. They don’t belong here but they are widespread–and so are things like prickly pear cactus which have been really useful in their original sites but wreak havoc here. 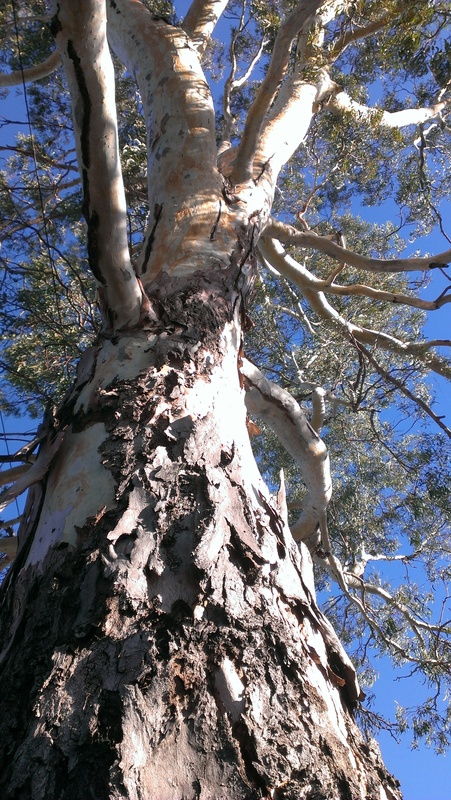 The same has happened when our eucalypts have been exported to places where they fuel immense bushfires. Australian possums are devastating native plants in NZ/Aotearoa. I don’t think you can have too much empathy. i think it is right to feel sickened by destruction. I also think it’s important to figure out how to move beyond being frozen in horror and unable to take action. One reason I clean up my neighbourhood and plant things and make bunting… is to have small steps I can take in the face of what feel like overwhelming challenges. I think sharing fears and hopes with my friends helps too. So thanks for sharing yours. Sometimes I think crying is the perfect thing to do. A hard heart is not much use for facing the world or even one’s own life. If you don’t know it, you really must hear ‘From Little Things, Big Things Grow’ by Kev Carmody and Paul Kelly. It makes me cry but also gives me hope. Others have faced challenges so much bigger than those I face. Wonderful, as always. The hard lesson for me is always in remembering that we are not only one with the beautiful tree, but also with the people who are doing the things we detest—like dumping trash or stealing plants. Then I have to remember to keep my righteous fury in check and find a better way to think and act. How to turn anger toward compassion? That is hard. Exactly so. One of the projects I am currently on is thinking regularly on these smaller things–since there are much bigger things to think about (like how we as humans are driving climate change and even the prospect of the demise of our own species isn’t making us stop). I am not sure checking righteous fury is always the right response. I feel the same way about tolerance: in principle, I like it and aim for it–but not in every situation no matter the context. But like you, I try to think hard before I let the righteous fury loose, and I am always looking for better ways to think and act. I wonder if caltrop is a bit like discovering your brother in law is an abuser. Sometimes we have to take steps to intervene. Working out what might work and what might be appropriate for all concerned takes considerable thinking, but managing our own feelings and not taking action isn’t appropriate either. I thought hard as I passed plantain and whitehorse deadnettle and feral grasses and so many other weeds on the way to remove caltrop. Thanks for your kind comment. I have huge respect for your thinking about integrity and values. It’s good to have company in the figuring. You are exactly right. It does have a place, and sometimes righteous fury and its resulting action IS the face of compassion. My problem is that righteous fury is what comes to me first, and so I have to step back and think. Trying to learn the difference between response and reaction. They are not the same. Just as thinking and feeling are not the same thing. But it’s easy to get them all tangled together. One of these days we’ll figure everything out, right? Just catching up here and this post in particular struck a chord with me. I live in a small community in North Wales (UK) which a lot of local families have called home for many, many generations. As an incomer who has only lived here for twenty years I am only just beginning to see the locality, the land and what grows on it, as they do. It’s an interesting idea, the incomer, isn’t it? It sounds like you’re finding a sense of place and home… in a new way… twenty years on, and that sounds wonderful. Thanks for your comment.